BBC News headlines scientists have discovered a new class of Super Earth planet; a water world with a thick, steamy atmosphere. 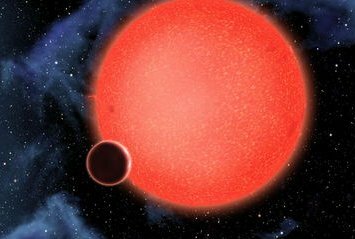 The exoplanet GJ 1214b is located 40 light years away, it's about 2.7 times the Earth's diameter but the mass is just seven times higher. At an equivalent density to Earth the planet would have nearly 20 times the mass, thus this means this planet has a significantly different composition our planet. The researchers said their results are more consistent with a dense atmosphere of water vapour, than one with a haze. Calculations of the planet's density also suggest that GJ 1214b has more water than Earth. This means the internal structure of this world would be very different to that of our own. "The high temperatures and pressures would form exotic materials like 'hot ice' or 'superfluid water', substances that are completely alien to our everyday experience," said Dr Berta.